Everybody around Southern Ontario circa 1992-1994, and is also addicted to television as much as I am, remembers the McCain frozen drink commercial where Roberto Alomar catches a frozen ‘fruit punch’ can and says, “Catch the Taste.” Somehow that is an iconic symbol of the time in this region, and so was Alomar. He absolutely dazzled fans with his play. 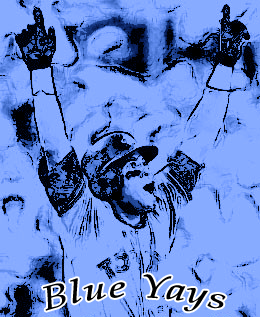 And to him we weren’t just the “Blue Jays,” we were the “Blue Yays.” As his latino accent were only permit him to say. He definitely gave the fans a lot to go, “Yay” over. He was our best player. Alomar could hit, steal bases and play some of the most outstanding defense at second base that you have ever seen. I’ve never seen a player cover as much ground defensively at second base as Alomar did. If only they had Fangraphs and UZR back then? I’m sure it would be off the charts! Alomar really did it all for the team. Many argue that the ‘Alomar ALCS homer‘ is the greatest moment in Blue Jay history, even ahead of Joe Carter’s World Series winning shot in 1993. They also argue that Alomar is the greatest Blue Jay in history … bar none. When you look at Alomar’s ability to be a 5-tool player, and consider his importance to the two World Champion teams in 1992 and 1993. It is hard to dispute that Alomar is not the greatest to have ever worn a Blue Jay uniform. Just that fact is good enough for me to put him in the Hall. Here I was talking about how Arod has changed the game of baseball with his antics. How utterly tired, disgusted and disappointed I was with the whole steroid issue in baseball. The only thing that I was glad about, was that Arod is not a Blue Jay and I’m not a Yankee fan. that I will not even mention it in this post (if it is true). I’ll put it this way, Alomar used to have a popular McCain frozen concentrated fruit juice commercial where he excited said at the end of the commerical, “catch the taste!’ You don’t want to know what he has been making people catch these days. Ugggghhh!!! I’m having a hard time writing this actually. We all knew Alomar had a bad side, as evidence from the umpire spitting incident and couple other things I can’t think of off hand, I did not think he was this bad. If this is true, once again, all respect for Alomar is lost. 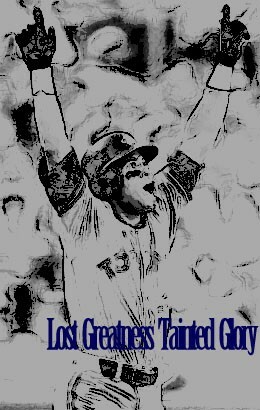 I feel embarrassed promoting him as the ‘greatest Blue Jay of all-time’ in previous posts. I also feel embarrassed for my favorite team. Probably the two most amazingly great teams of my time (the 92-93 World Champion Toronto Blue Jays). Alomar was a huge part of what got the Jays to where they were in those years. I maintained a great respect for Alomar, being a fan, even through all of his shortcomings. Now I feel like a piece of dirt for promoting the player that he was. Out of principle, I’m dropping Alomar on my ‘greatest Jays of all-time’ list, if this is true. Other Jays fans should do the same if you based your criteria for the list on more than production. Sad day for me in Blue Jay land. Quite frankly, I wish he had taken steroids because this is atrocious. PLEASE DO NOT BE TRUE!! ROBBIE SAY IT AIN’T SO!!! A former Blue Jay was inducted into the Hall of Fame yesterday. If you are searching trying to find the name, it is Ricky Henderson. That makes four Blue Jays now in the Hall of Fame, the others being Paul Molitor, Dave Winfield and Phil Niekro. Pretty darn good for a club that came into being in 1977 if I do say so myself, better than the Mariners at least. Although these players together are ‘Blue Jay Hall of Famers,’ the other thing that they all have is common is they didn’t stay here that long. Ricky only played in Toronto for half a season plus the playoffs in 1993, Niekro’s great career ended in Toronto after the 1987 season, Winfield only stayed one year to help us win the World Series in 1992 and Molitor’s time in Toronto consisted of one World Series in 1993, a strike shorted year in 1994 and another year in 1995. Suffice to say, none of these players actually went into the Hall as a Blue Jay. This is another reason why the Jays should not trade Roy Halladay, although Roberto Alomar (arguably the greatest Jay ever) might have a shot before him. I’ve drifted a bit, so back to Superman. If Jays fans can remember, Toronto and Oakland had a short-lived rivalry in the early 90’s. We met Oakland in the 1989 ALCS and the ALCS in 1992, winning one of those meetings (Alomar’s amazing homerun off Eckersly in 92 – Game 4 some might remember). Henderson was so good in those series, that Jays fans and broadcasters referred to him as ‘Superman.’ The Oakland ALCS win over the Jays in 1989 saw Henderson steal 8 bases against the Jays in 5 games. He won MVP for the series. The Jays, in particular, had gained a great respect for the athlete that he was. Hence the name, ‘Superman.’ I remember hating him, and being scared of him everytime he lead-off for the A’s. So what do you do with your enemies? Keep them even closer some might say. I commend modern GM mastermind Pat Gilick on pulling a trade-deadline manuver that brought Ricky to the Jays in 1993. He was definately one of the players that helped the Jays go back-to-back in 92-93, even though we made him move to right-field. Alright, now for a funny Ricky Henderson story. My favorite was upon Ricky being reunited with John Olerud later in their playing careers with the New York Mets, Henderson said to Olerud: “I remember playing with a guy that always wore a helmet in Toronto?” Olerud, who did play with Ricky, and together with him won the World Series in 1993, always wore a helmet on the field-of-play for medical reasons. He couldn’t even look at Ricky with a straight face after he said that. As I rejoice in the Blue Jays Opening Series three game sweep of the defending champion Boston Red Sox, I am reminded of a past Blue Jay great. Roberto Alomar, a man who facilitated many three game sweeps in his day. The only current player, or in the last 15 years, that I can compare him to, is Jose Reyes of the Mets. A guy that can give you everything; defense, speed, homers, hit for an average … everything. That is what Alomar was for the Jays when he came over in 1991, with Joe Carter. On Friday, he was honored in the Blue Jays level of excellence and deservably so. I still remember the 1992 ALCS, and his game 4 homer in the 9th, off the toughest pitcher in game at that time, Dennis Eckersly. An improbable homer that really lifted us to the World Series and probably beyond. Alomar’s black eye paint, dirt stained pants, coming up bigtime clutch in the hot California sun. Oh ya, he was a GAMER. Sorry Jose Reyes, but you are going to have to prove yourself a little bit more, before you can be compared to on Alomar’s level. Alomar stole most of his bases as a Jay, he later developed into a more premier hitter with Baltimore and Cleveland. However, for the two years that the Jays won back-to-back World Series, there was no question that Alomar was the most outstanding player on the field. Heres to you Robbie, “Catch the Taste” like in the popular McCain frozen concentrated orange juice commercial, that was so near and dear to our hearts in those days. lol. So, I brought my broom to the park today, taking a risk, I know, but it payed off. Big Frank Thomas with a massive grand slam in the 6th inning. I went crazy!! I was sitting in front of the Jose Calderon, Carlos Delfino, Jamario Moon and other Raptors. Kind of cool, hope they do well in the playoffs. Anyway, looks like a promising year for the Jays, more on them and my food of the week in my next blog. You don’t want to miss it.